Following the 2008 financial crisis, many observers were surprised by how much many Americans began saving. From 2009 to 2012, total household debt fell considerably, dropping by more than 12 percent from 2008 to 2013. The CMD’s latest Quarterly Report on Household Debt and Credit reveals that total household debt achieved a new peak in the first quarter of 2017, rising by $149 billion to $12.73 trillion — $50 billion above the previous peak reached in the third quarter of 2008. Balances climbed in several areas: mortgages, 1.7 percent; auto loans, 0.9 percent; and student loans, 2.6 percent. Credit card balances fell 1.9 percent this quarter. If we look at all the components of debt since 2009, we can see that most components remains near or below the former peak levels. 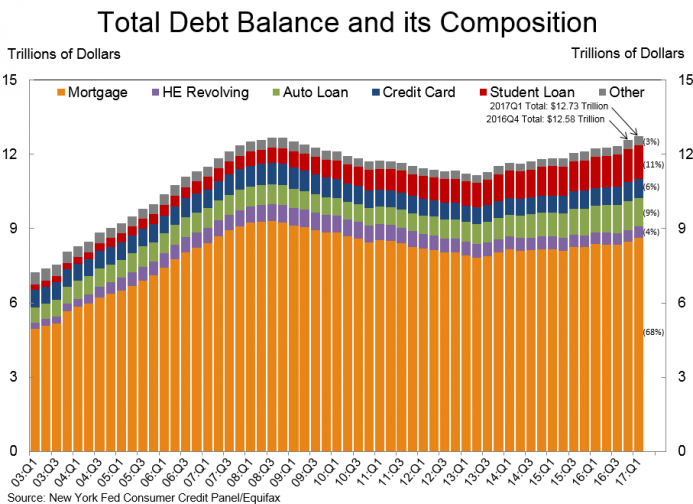 What’s pushing total debt up is student debt and auto loan debt. In this next graph, in which I index all debt levels to the 2008 3rd Q peak, we find that most debt components are near or below the old peak levels. Total debt (the black line) has just now risen above the old peak, with mortgage debt (the light blue line) still below the old peak (represented here by the value of 1). But, if we look at student debt and auto loan debt, we see that debt is well above its old peak. 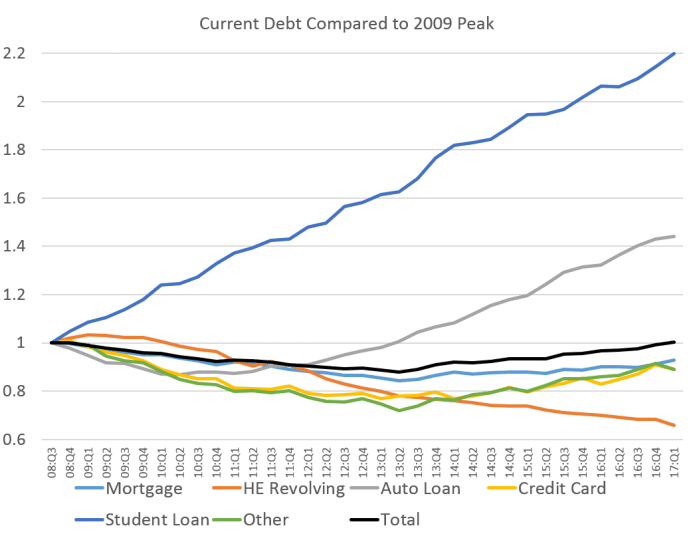 Student debt is now more than double what is was in 2008, and auto loan debt is almost 50 percent higher than the old peak. Nevertheless, either way you look at it, the old debt-cutting ways of the population that prevailed in the wake of 2008 appear to now be over, and debt is mounting back to old peaks. Not surprisingly, the largest components of total debt tend to benefit greatly from government interventions and subsidies. Mortgages are subsidized by a plethora of programs including loose monetary policy and a secondary market for loans dominated by government-owned Fannie Mae and Freddie Mac — not to mention the benefits of the too-big-to-fail FHA. Many student loans, of course, are directly subsidized by the federal government, and auto loans continue to be helped along by rock-bottom interest rates made possible by quantitative easing. [T]his is more of an intended feature than a flaw of the Fed’s monetary policy since the housing bubble popped. Expansionary monetary policy can only replace bubbles with new bubbles. Malinvestments are not totally liquidated, but shift from one sector to another. Consumer debt is not directly paid off, but transferred from one type to another. 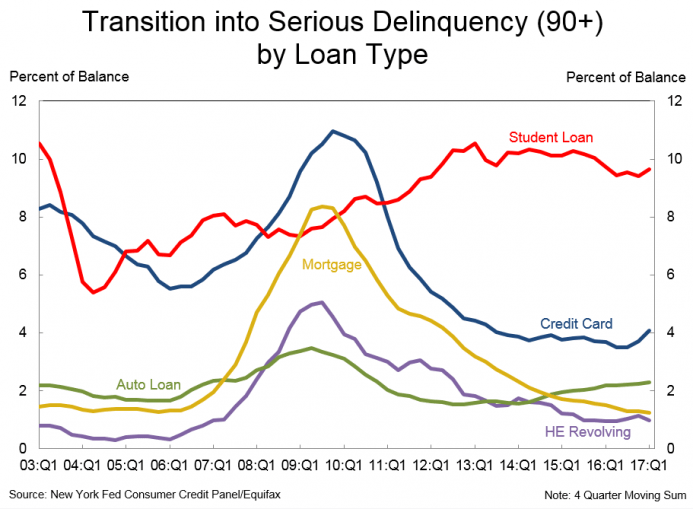 With the exception of student loans, however, delinquency rates are not exceptionally high, and the current boom — while weak by historical standards — appears to be continuing. The trouble will come when consumers can no longer keep up with debt payments and money begins to disappear from the fractional-reserve banking system, setting in motion deflation and recession. 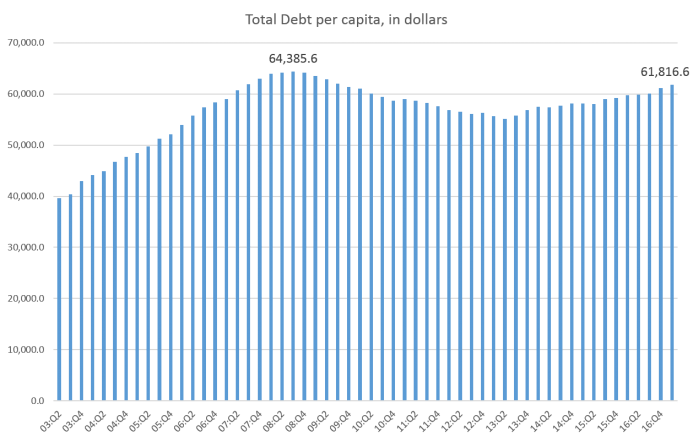 It’s a correction that’s badly needed, but as of the first quarter of this year, at least, the money continues to flow, and debt is enabling many Americans to keep expanding their spending for now. *Ryan McMaken is the editor of Mises Wire and The Austrian. Send him your article submissions, but read article guidelines first. (Contact: email; twitter.) Ryan has degrees in economics and political science from the University of Colorado, and was the economist for the Colorado Division of Housing from 2009 to 2014. He is the author of Commie Cowboys: The Bourgeoisie and the Nation-State in the Western Genre. 1. This per capita figure is calculated by dividing the total debt level by the number of working-age persons in the US.